The Exxy Omni Jr. Universal L-Bracket for Mirrorless Cameras from Fotodiox is Arca-type compatible camera bracket with a dovetail on each axis that allows a camera to mount on a tripod head vertically or horizontally. The black anodized-aluminum bracket provides a larger hand grip to the camera, which is normally smaller than DSLRs, and the side mount slides down to gain access to the camera's ports. The bottom plate stops short of the battery chamber, which does not block it, and you can change batteries easily. Additionally, a hand or shoulder strap can be attached via the strap loop, and four 1/4"-20 accessory mounts are found on the base of the L-bracket. 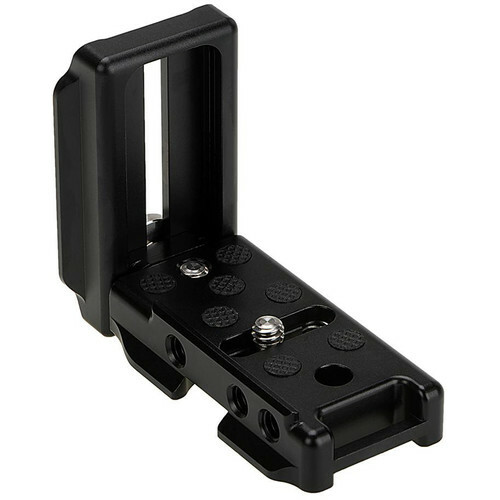 Box Dimensions (LxWxH) 4.15 x 2.0 x 1.0"
Exxy Omni Jr. Universal L-Bracket for Mirrorless Cameras is rated 3.3 out of 5 by 3. Rated 5 out of 5 by Brian from Near Perfect L Bracket for my Olympus OMD EM-1 mk1 This fits my Olympus OMD EM-1 mk1perfectly while still allowing access to the battery compartment. if using in the landscape mode I can slide the left-hand portrait arm down to give access to the remote release port, no other L Bracket that I could find would do this. This accessory is very well made for the very reasonable $39.95 price tag. Rated 3 out of 5 by Raymond from Well made, too small Not quite universal as it doesnt fit my Canon M6. Seems to be well made otherwise. Would have been useful to have dimensions on the product page. Does this fit the Canon M6? Well I ordered this item based on your answer and I it definitely does not fit my Canon M6. The extender piece on the base needs to be about 5/8 inch longer.